With the special counsel’s Russia investigation reportedly wrapping up, Trump took to his Twitter to retweet a message asking that his political targets be investigated for treason. President Donald Trump took a break from formulating his own tweets to retweet some messages from a Twitter “fan account” that goes by the name The Trump Train. 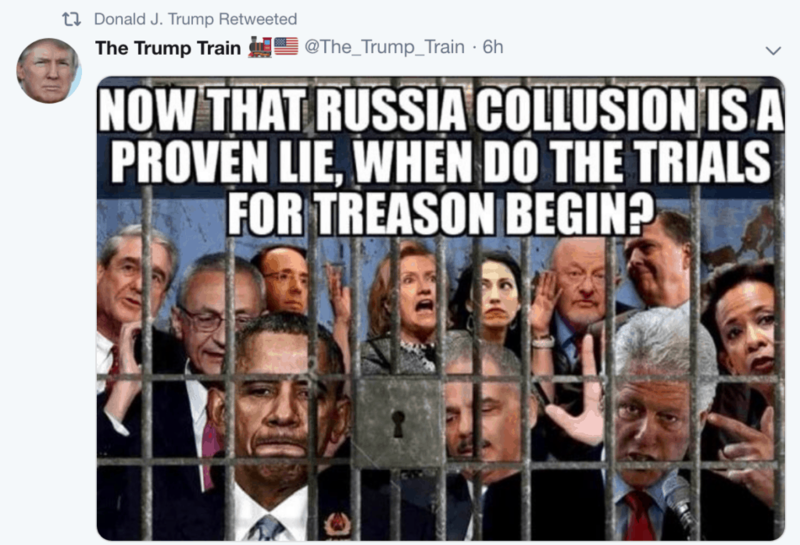 One tweet, in particular, included a meme of various Trump political targets behind bars, including Barack Obama, Bill and Hillary Clinton, Special Counsel Robert Mueller, Clinton’s former campaign manager John Podesta, former Director of National Intelligence James Clapper, Obama’s Attorney Generals Eric Holder and Loretta Lynch, Clinton aide Huma Abedin, and James Comey. The photo also includes a picture of Rod Rosenstein, the acting Deputy Attorney General who Trump nominated in January 2017. This isn’t the first time Trump has called for his adversaries to be investigated. The New York Times reported on Nov. 20 the president had requested his previous White House counsel, Don McGahn, to prosecute Hillary Clinton and James Comey. Trump’s retweet of the jail cell meme followed his own tweets pertaining to “the Mueller Witch Hunt” being a “total disgrace,” his displeasure with the special counsel, and another request for an investigation into Hillary’s emails.